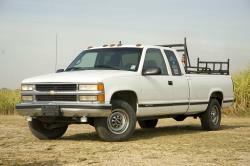 For the 1996 model year, General Motors released a new line of Vortec engines for its GMT800 Chevrolet, Cadillac, and GMC fullsize pickup trucks and SUVs. The name is derived from the unique intake ports and cylinder walls, which are designed to create a vortex between the air and fuel as they enter the combustion chamber. The idea behind the General Motors Vortec engine design is to increase the velocity and volume of air entering the combustion chamber. That way the air will be able to mix more thoroughly with the fuel, which allows the engine to create more power by burning the fuel more completely. The stock air intake system however, can't provide enough air for the 4.3L Vortec, 5.0L Vortec, or 5.7L Vortec to reach its performance potential. 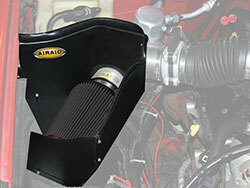 And that's where the AIRAID 202-240 cold air intake system comes in. Instead of relying on the restrictive factory air box and 'surface loading' paper air filter. The whole intake system gets replaced by a high-flow AIRAID SynthaMax air filter, that is surrounded by a specially designed Cold Air Dam (CAD). When the hood is closed, a rubber gasket on top of the CAD seals out hot engine bay air, creating a virtual cold air chamber. 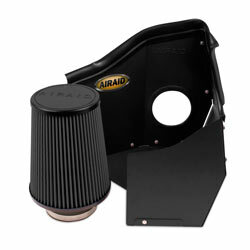 The oversized AIRAID performance air filter can then ingest a much higher volume of cold air, as it rushes in through a hole in the side of the fender well. All of that oxygen-rich cold air is then cleaned as it passes through the washable synthetic air filter. It's made from two distinct layers of non-woven polyester, that have been specifically developed to trap and hold even the smallest dirt particles. Then you can just wash it out and keep going. No oil treatment required. Plus, it's backed by the AIRAID No-Hassle Lifetime Warranty, so it will probably be the last air filter that you have to buy. Because the AIRAID 202-240 cold air intake utilizes the factory intake tube, all of the stock sensors and ECU settings remain unchanged. This allows for a simple installation, and 50-state street legal status.